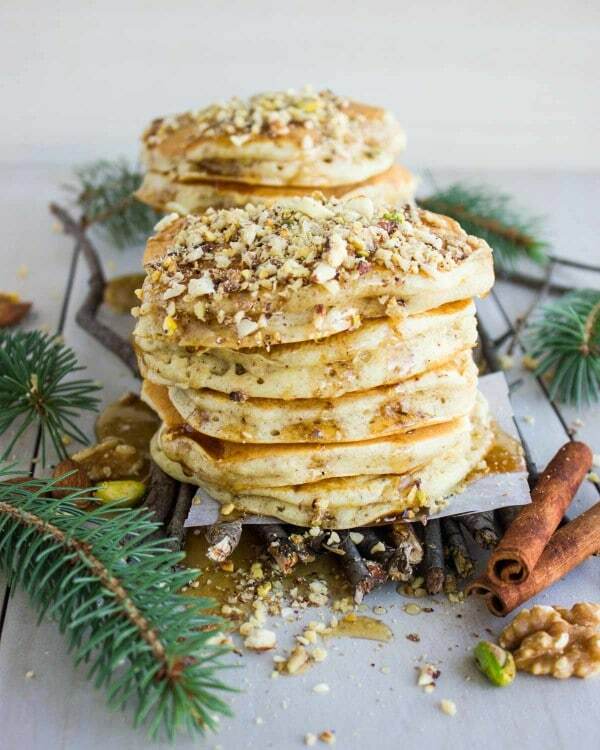 North America meets the Middle East in these fluffy orange-scented Baklava Pancakes topped with chopped nuts and drizzled with Canadian Maple Syrup! Serve them as a special breakfast treat and you’ll be declared mom of the year! There’s nothing like good pancakes to enjoy and share with friends and family. 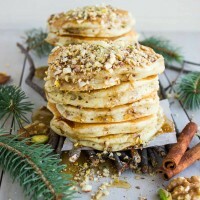 These baklava pancakes with maple syrup are just as satisfying and comforting as classic pancakes, but with a richer flavor and more interesting texture from chopped pistachios. It’s the pancakes you’ll make when you’re looking for breakfast and dessert at the same time. I’ll have to admit that growing up, pancakes weren’t a breakfast staple at my home. We were living in Paris at the time and the delicate, oh so delicate and perfect French crepes ruled the breakfast table. Also, I suppose my mom (just as I find myself in many cases now) didn’t want to risk messing with our breakfast routine so pancakes made quite a late appearance. As it turns out, I now find myself making pancakes more often than I expect! As much as I love the classic vanilla pancakes, many times I find myself flavoring my pancakes for different occasions/seasons and every time it feels like I had a treat for breakfast. These baklava pancakes are a perfect example. Yesterday I took my littlest one and went to a fabulous Maple syrup festival with 3 other families. One of the best Spring activities to do with kids if you’re in Canada! The forest was beautiful, the weather was gorgeous, the kids had a great day outdoors, and we all learned a thing or two about maple syrup! We also all tasted the freshest possible maple syrup there is and bought a few things to take home. As part of the festival, there were fresh pancakes served with Maple syrup which we all enjoyed! And that was about when I started realizing how fabulous maple syrup would be with nuts! And even more with a touch of cinnamon and a hint of orange zest! 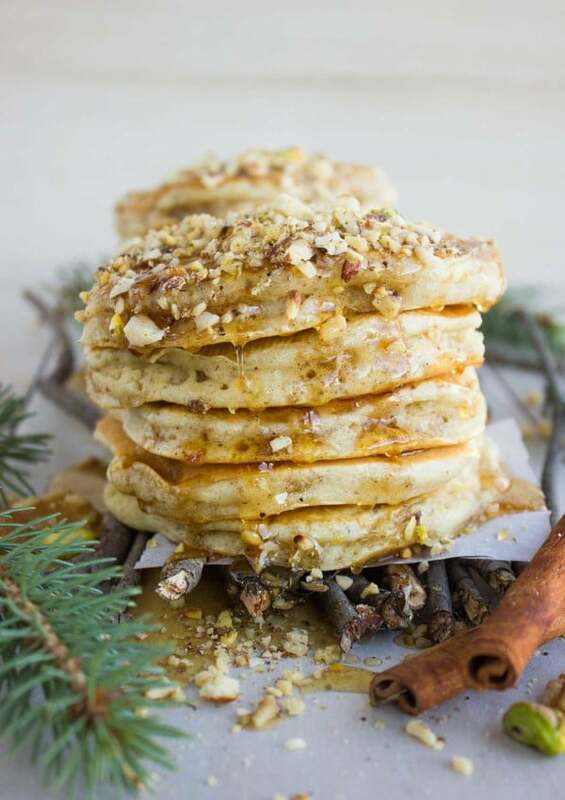 These baklava pancakes with maple syrup offer the same comfort as classic pancakes, but they come with a rich, warm cinnamon and orange flavor. The chopped nuts add a nice crunchy element and take these pancakes to the next level. 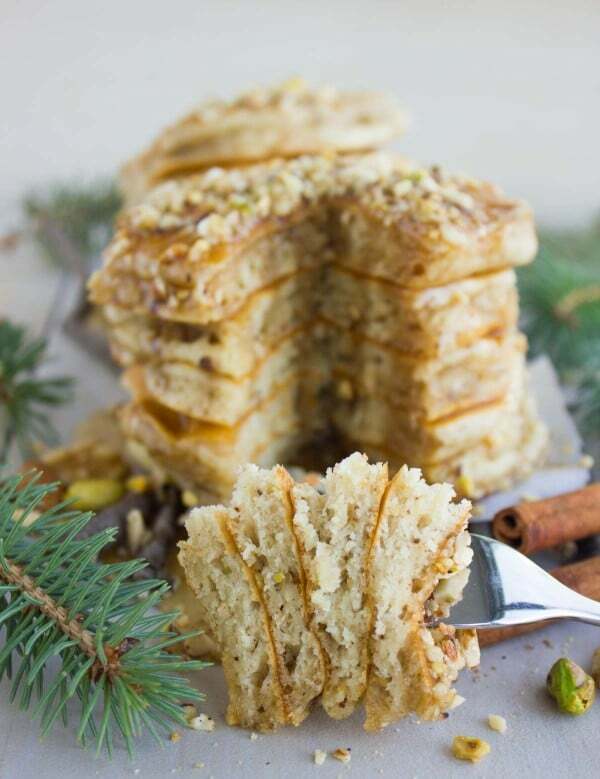 Eating Baklava Pancakes really feel like having dessert for breakfast – perfect for those cold and grim mornings that call for a nice comforting breakfast! These Baklava Pancakes are a snap to make. Flour, baking, baking soda and a pinch of salt are mixed together in a bowl. Eggs, buttermilk, vanilla, oil (or melted butter), a touch of orange zest, cinnamon, a little bit of sugar and plenty of toasted crushed nuts get all mixed together. Then the flour mixture is ever so gently folded into the nut mixture until no visible flour remains, but lumps are very very welcome to remain. They will offer tenderness and fluffiness to your pancakes, so make sure you don’t get rid of them! Cook the pancakes adjusting the size and thickness to your taste, I love mine a little on the thick smaller side as it makes for better pancakes stacking! For my nuts, I used a combo of walnuts, pistachios and almonds, but feel free to use any nuts or just one type. Make sure not to overmix the pancake batter or your pancakes will turn out dense and flat. These Baklava Pancakes taste best when served with real Canadian Maple Syrup. Don’t skimp on the quality there! 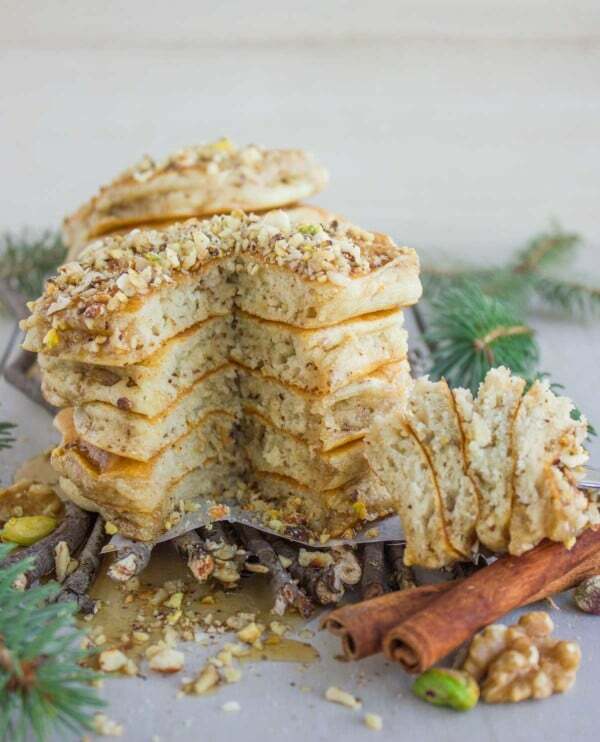 North America meets the Middle East in these fluffy orange-scented Baklava Pancakes topped with chopped nuts and drizzled with Canadian Maple Syrup! Serve them as a special breakfast treat and you'll be declared mom of the year! In a large bowl, add the flour mix ingredients and whisk them until all well combined. In another bigger bowl, add all the wet mixture ingredients and whisk them well. Add the flour mix into the wet mixture and using a spatula or even a wooden spoon, mix the pancake batter well until no more flour mixture is visible but the batter is still lumpy. Take your 1/4 cup measuring cup and fill it a little over half way with batter and pour it on top of the hot griddle or skillet. With the back of the 1/4 cup measuring cup, spread the pancake batter gently into a circular shape. Let the pancakes cook for 1 minute before flipping them on the other side and let them cook for an extra minute or minute and a half (cooking times will depend on the size and thickness of your pancakes). 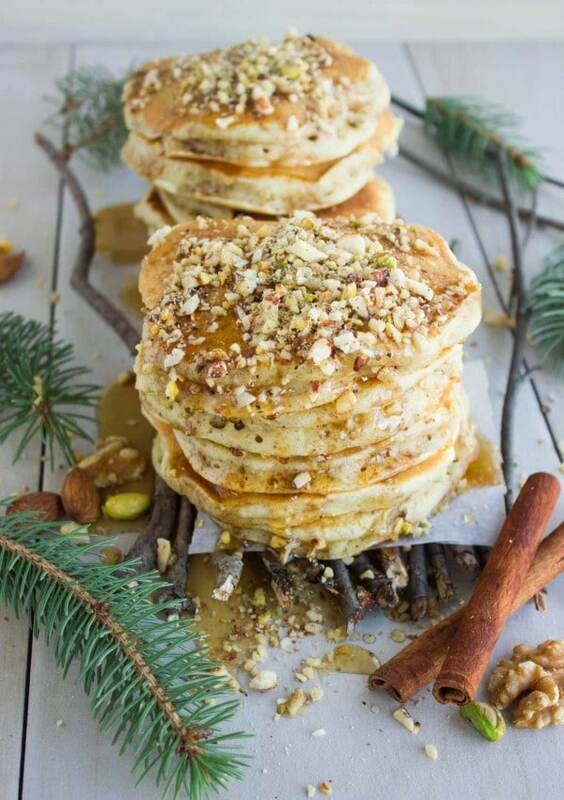 Stack your pancakes (if using smaller sizes), drizzle them with fresh Maple syrup and top them with plenty of nuts. For my nuts, I used a combo of walnuts, pistachios, and almonds, but feel free to use any nuts or just one type. These Baklava Pancakes taste best when served with real Canadian Maple Syrup. Don't skimp on the quality there! Ha! Ha! It’s so funny the lengths we will go to for styling props. It was definitely worth is because your pancakes are gorgeously styled. And since they are are infused with baklava flavor, I bet they test even better than the standard pancake. Thanks Lynn for the kind words:) Hope you try those soon–they’re like a pancake treat! Hi Mahy – It’s Tina, one of the parents from the maple syrup festival! Noha pointed me out to your site. Glad you & your little one enjoyed the day – and it’s great to see how the day inspired this creation!! Everything looks beautiful and delicious on your blog. Hi Tina! Glad you found your way to my blog:) Thanks for the kind words! These were very good, i’ve made them several times, thanks for the recipe! what a fun and unique idea for flavors. I am sure everyone that eats these has the wow factor! Those pancakes look so light and fluffy — a perfect holiday morning breakfast! It’s been years since I’ve made pancakes — ever since I had kids and grandkids in the house for breakfast. Now that we’ve moved and live closer — I’ll have to make this recipe for them. Oh my goodness now it will be my favorite breakfast! My kids will also be delighted with these pancakes. They look absolutely perfect. 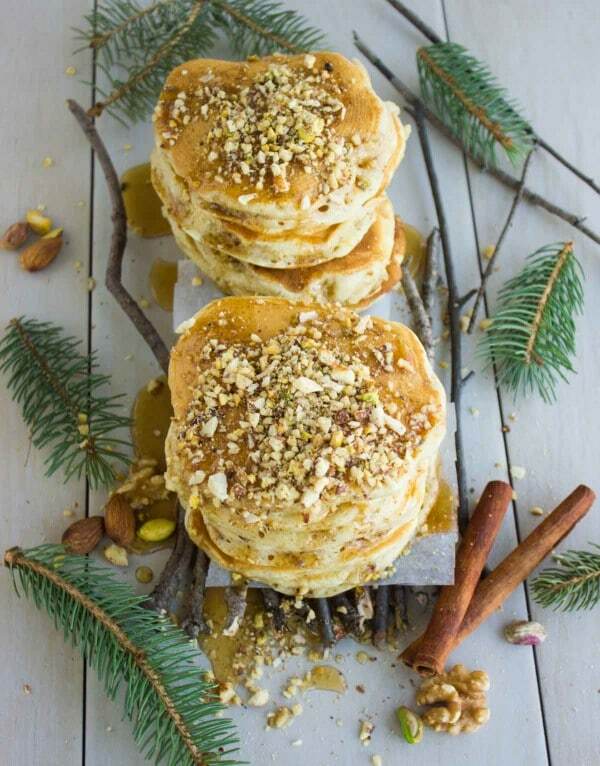 These baklava pancakes look so delicious! I’d love to have a small stack with a pat of butter and drizzled with pure maple syrup.